Atum is the "soul of Nun" and hence the capacity to self-create eternal repetition and therewith the forces of the universe (Ennead), creation (Horus, Re) and its order (Maat). At midnight, as a result of his union with the mummy of Osiris, Re taps into Atum's precreational power by projecting himself out of the created order and returning regenerated & rejuvenated. The Amduat (ca. 1426 BCE), the book of what is "in the Duat", divides the nocturnal journey of Re into 12 Hours, starting at dusk. 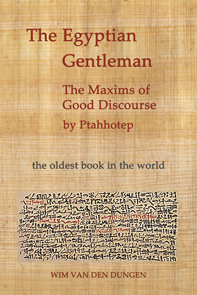 The presence of this remarkable book, with its unseen fusion of visual and textual meanings, also underlines the accessability of the Duat by those still living on Earth. Although found in royal tombs and belonging to the privilege of the divine king, these texts are not exclusively funerary, but speak of a this-life ritual of rejuvenation (regeneration - cf. Osiris) & (royal ?) illumination (Re). "It is good for the dead to have this knowledge, but also for a person on Earth ; a remedy - a million times proven !" The first speculations on record go back to the Middle Kingdom (ca. 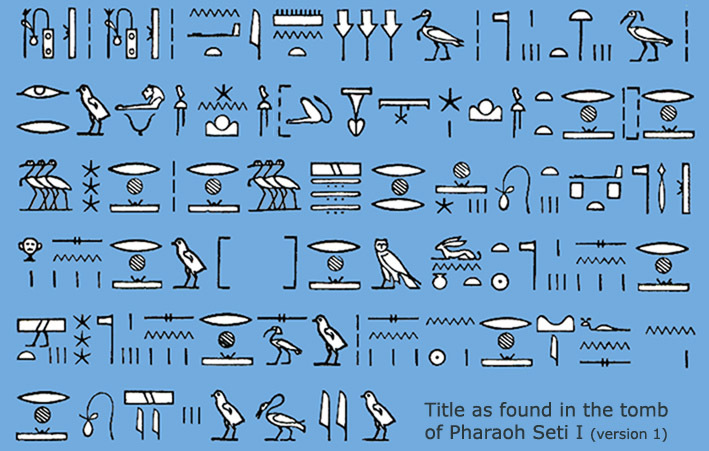 1938 - 1759 BCE), if not earlier (First Intermediate Period). 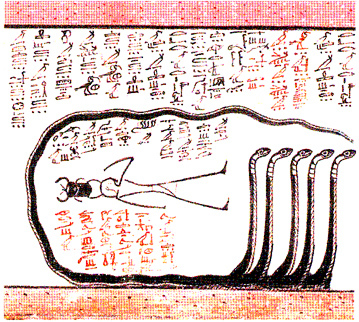 Even in the Old Kingdom, the movement of the "sah" (the mummy), from sarcophagus (buria-chamber or "Duat") to the transfigurating horizon (antechamber or "Akhet"), and from there to the circumpolar stars as a spirit (or "Akh"), reflects complex preoccupations with ecstatic & postmortal conditions. 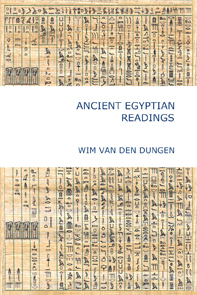 In the Pyramid texts of Unas, the earliest, complete and authorative corpus of Heliopolitanism, the Osirian rebirth and Solar illumination of the divine king are described. It is clear ascension to Re is impossible without passing through the kingdom of Osiris. In the Old Kingdom, this journey was the privilege of the divine king. 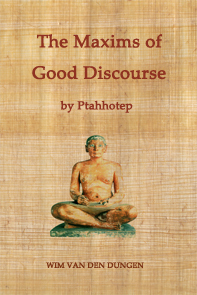 Indeed, in this period of Ancient Egyptian history, his position was still absolute. But after the Middle Kingdom, when personal responsibility (everybody had a Ba) & the role of the deities (in particular Re) became more important than the presence of Pharaoh, the journey had to be undertaken by Re himself. the gate of the western horizon. In the first six Hours of the journey, the differentiation of conscious awareness (represented by the soul of Re), started at noon, ends with depletion. At midnight, a conjunction happens between this Solar awareness and the divine substrate or ground of consciousness. At this point of singularity, or unity between the soul (Re) and the body (Osiris) of consciousness, awareness spontaneously ascends to the ultimate autogenic cause of consciousness (Atum), situated at the beginning of time ("zep tepi"), outside the natural order of the observable universe (Nun). In the conjunction, Osiris, the divine consciousness-stuff as such, witnesses himself. Realizing its autogenic potential, this living consciousness of Re-Osiris (i.e. soul united with body) returns a formidable energy-surplus to the universe and regeneration starts. A new cycle of 24 hour is made possible. Conscious awareness integrates itself in the last six Hours, and its perceptions are renewed. "This nocturnal regeneration of the sun demonstrates, by way of example, that powers of renewal are at work on the far side of death. At the same time, the journey occurs in the spaces of the human soul, in which a renewal from the depts become possible. That it is an odyssey of the soul is emphazised by the Egyptians through the indication that the sun god descends into the depths as a ba-soul (and thus is ram-headed, since ba is also the word for ram) ; herein lie significant antecedents of modern psychotherapy." These studies of the Midnight Mystery and its Ars Obscura are divided into two sections and a discussion of the 12 Hours, to be finished over time.